Masterplans: Can You Get an E2 Visa with Less Than $50,000? An immigration attorney emailed me yesterday morning to ask whether I’d ever seen a successful E-2 visa case where the investment was under $50,000. My initial response (I'm paraphrasing) was “No. We’ve been hired to write for applicants where the figure was lower than that, but I can’t recall an approval--at least one I learned about--lower than probably $60,000” (an admittedly arbitrary watermark around which I could recall a handful of success stories). Across the nearly 1,000 E-2 visa business plans Masterplans has written since George W. was in office, the vast majority land above the oft-cited $100,000 threshold. Most attorneys I know like to see $125,000 or $150,000 on their E-2s, and some pricier firms with well-heeled clients routinely send cases our way where the investment level is two to three times that amount. But immediately after sending this quick reply, I remembered a recent email, sent by a client who hired us this spring for what she described as a very modest project: specifically, a rewrite of her own work, an updated industry report, and some financial modeling to help support her attorney’s petition for her five-year visa. She stressed that controlling costs was important, and when I saw her planned investment total, I could understand why: there simply wasn’t much cash in this business. Anyway, her message to us was one of gratitude, smiley-face and all, because her case was APPROVED. The total outlay? $46,087. 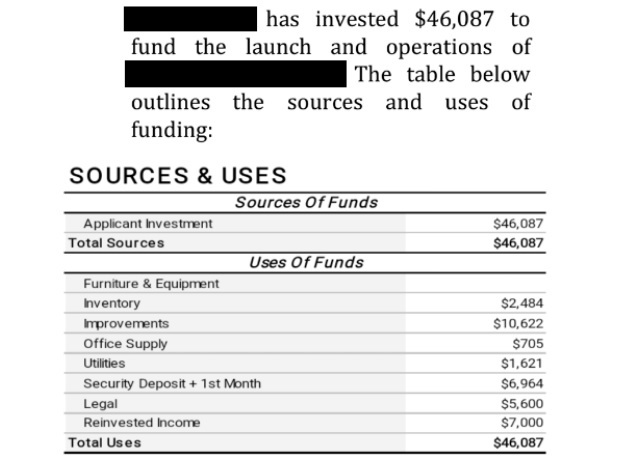 Remembering this bit of praise, I opened the plan on my phone (confession: I was at my daughter's swimming lesson by this point), took a screenshot of the Sources & Uses of Funds table, and emailed it to the attorney who’d asked about the $50k, with a "Wait, well actually..."
Is it ideal to file an E-2 with such a low investment? Probably not. Is it tenable? If the business doesn’t require more capital than that, and can operate successfully in the U.S. under this person's guidance, then…possibly. We’re all happier when an E-2 petitioner has more cash to put forward than this. It makes a case feel stronger and paves the way for a winning argument to the adjudicator that the company can thrive quickly and even support some new U.S. jobs. Moreover, clients with $200,000 or more to invest are far less likely to be turned off by the necessary legal fees, filing costs, and--yes--our own fee for the business plan. This sense of ease can facilitate the whole process from the initial consult on, something I imagine is true not just for service providers like us, but for lawyers as well. This isn’t exactly a cautionary tale about turning away business that could have a potentially satisfying outcome; rather, it’s a good reminder that the investment for an E-2 is meant to be proportional to the business model, and if everything else is in order, a consular officer may just green-light something that initially seemed like a tough sell. I’m sure the client is grateful for the result, but I'm equally grateful for the case study.